Backgrounds Online attended the National Association of Professional Background Screeners (NAPBS) 2016 conference in Palm Desert, CA. The NAPBS is the leading national resource for issues related to the background screening profession. 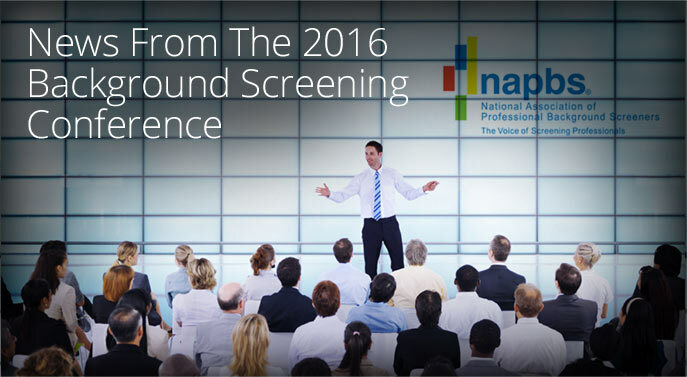 Nearly 800 screening professionals attended the conference, making it the largest in NAPBS history. This year's focus was on screening best practices, compliance and other topics that impact the screening industry. Here are some of our key takeaways. Are You Screening The Right Person? One of the hottest topics stressed the importance of screening the right person. Presenters shared stories about people who were denied employment after a background check was run on someone with a similar name. Mistakes like that can be costly and damaging to your reputation. The screening professionals at Backgrounds Online take precautions to ensure we screen the right person. Our team continually refines and improves this process. To start, we request the applicant’s full legal name. When you submit a background check request, we recommend including the candidate’s middle name or initial. This is vital for people with common names. Middle names help us find people who best match your criteria. We check relevant results against reliable identifiers, such as a Social Security Number or Date of Birth. This empowers us to pinpoint the exact individual. Only then do we start the screening process. Next, our screening experts validate the records at local court houses. This provides an unparalleled level of quality control and helps assure our reports only include information that may legally be used for hiring purposes. When Can You Ask Candidates About Criminal Records? There are numerous rules regarding when you can and cannot ask about criminal records. These laws often vary by jurisdiction. The Ban The Box (BTB) initiative offers a perfect example. Many job applications used to include a checkbox that asked if the candidate has a criminal record. BTB advocates seek to remove that feature. They believe applicants who mark the box will not be considered, regardless of their qualifications and whether or not a record is relevant to the position. BTB laws have passed throughout the country, but they are not always consistent. This can lead to complicated scenarios. For example, you may have a candidate who lives in a city with one set of rules, but might work in another city with a separate set of laws. That's one reason why it is imperative for businesses to establish screening guidelines for every type of position in the company. Create a plan that covers how you will handle positive and negative screening outcomes. It's equally important to revisit and revise these policies regularly. In many cases, employers might not learn that an applicant has a criminal record until a background check is complete. Simply having a record does not necessarily make the person ineligible for hire. There are rules that cover what types of records may or may not be used to make hiring decisions. Your screening policies should include guidelines for considering applicants who have criminal records. What should you do if an applicant has a record that could negatively impact your business? There are steps you must follow before denying employment. It's never easy, but sometimes employers must refuse employment to candidates who initially appeared to be qualified. This can happen if a background report reveals and potentially harmful criminal records, or shows that a candidate does not have the necessary skills, education or credentials. A pre-adverse notice, which explains that the employer may be unable to extend an offer based on their background check results. A copy of their report and notification of their right to refute the results. A summary of their rights under the FCRA. Next there is a waiting period during which no additional action occurs. This gives the person time to review their report and file a dispute. No time frame is mandated, but 1 week is generally the minimum and 30 days is recommended. The staff at Backgrounds Online is prepared to talk with applicants about their results. We are dedicated to providing accurate data, and will work diligently to correct any mistakes that were reported to us during the screening process. If the applicant does not dispute their results, then the employer may commence with adverse and post-adverse actions. This begins with informing the applicant that they will not be offered employment. The recipient must be given the name and address of the company that prepared their report, and a summary of their rights under the FCRA. At Backgrounds Online, we keep a pulse on the industry and use our knowledge to help you remain compliant with your screening efforts. We offer the documentation you need for pre-adverse and adverse actions, provide blog entries and Newsletters with relevant information, and are here to help you. If you have questions, comments or concerns, please contact your Account Manager or our Support Team.